Ferry services has commenced between Fuvahmuh City in Gnaviyani atoll and Fares Mathoda of Gdh. atoll. 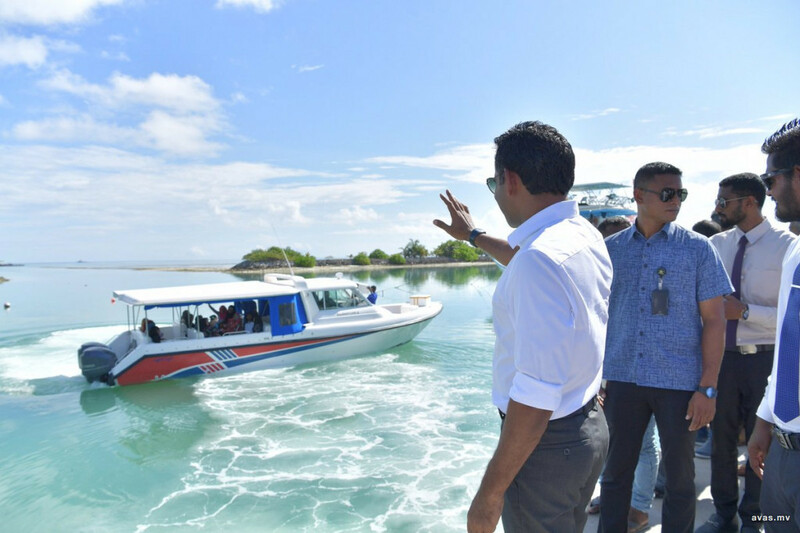 Vice-President Faisal Naseem inaugurated the speedboat ferry system established by Maldives Ports Limited between the two islands on Friday. At the inauguration ceremony held at Fares Mathoda, VP Faisal assured that the government would not alienate or exclude any island, and will instead bring a collective development all over Maldives. All state authorities are working together to provide quality services desired by the people of the nation, added the VP. "The secret behind the flourishing development of the Maldives is the work done collectively by the people of the Maldives as a whole. I urge all citizens to always be united and work together in order to reach the targets we wish to achieve", urged Faisal. In his speech, Faisal stressed the importance of ensuring that the future generations of the nation are patriotic and works for the benefit of the nation. The responsibility of building strong future generations lie upon the hands of parents and teachers, reminded Faisal, and urged them to carry out their work with responsibly. During his trip, VP Faisal met with the Island council and heads of several entities. He inquired regarding the difficulties faced by them, and discussed feasible solutions to overcome the challenges.